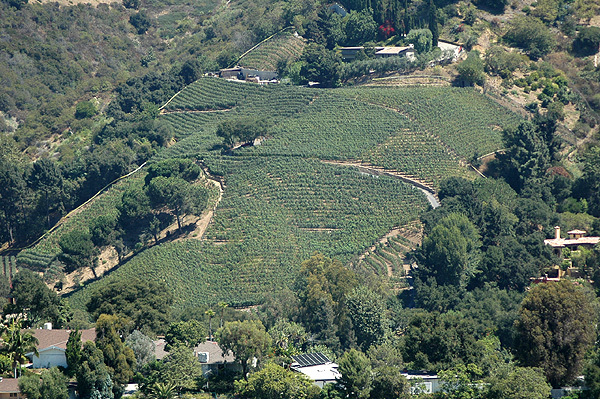 On one of the photo pages in Just Above Sunset - August 28, 2005, Very Far Above Sunset - you would find a shot of the only vineyard in Beverly Hills, sister city to Cannes, with the comment that this was not a commercial vineyard - the fellow keeps the wine to himself. My information came word-of-mouth from someone who lived in the area, as we walked by the place on the street below. I see in my local paper that the place is actually in Bel-Air, not Beverly Hills, which is a bit further east. Secondly, this place, Moraga Vineyards, is not only Los Angeles' lone commercial wine grape grower, the owner is now building an on-site winery, the first to be bonded in the City of Los Angeles since the start of prohibition. Thirdly, the house on the grounds - a 1939 "ranch-style" home - was built for the director Victor Fleming ("Gone With the Wind," "The Wizard of Oz") when Howard Hawkes was his only neighbor, and the stables on the grounds are where Clark Gable kept his horse. Ah, Hollywood history. It seems the place is "home to one of California's most highly regarded Cabernets" and has been owned for years by Tom Jones. No, not the Welsh singer wildly popular in the early seventies, but the Tom Jones who for thirty years was the chief executive of Northrop Corporation - an aeronautical engineer by training. He retired in 1990, so he was nominally my boss when I landed my first job there after I moved to Los Angeles from upstate New York in 1980 - although I was a lowly fellow instructing supervisors on employee relations and never saw him. Little did I know he was a major conservationist - a trustee of the California Nature Conservancy for fifty years - and that in 1959 he bought this fifteen acres of unused land for a little under a half million dollars. My handy CPI Inflation Calculator says his 450,000 outlay is the equivalent of well over three million these days. For fifteen acres of chaparral? And at $125 a bottle for his Cabernet, which includes 20% Merlot, and $65 for his Sauvignon Blanc, Jones certainly makes a profit on Moraga wine. He sells out his annual production of 600 cases to a list of 500 loyal mail-order customers, a handful of Parisian restaurants including Alain Ducasse, and a number of the most expensive restaurants in New York City and Los Angeles. Hotel Bel-Air carries Moraga as its "neighborhood" wine. And the wine is usually on the shelf at the only two stores that Jones allows to stock it: Wally's in Westwood and the Beverly Hills Cheese Shop. Is it good enough to be one of California's most expensive wines? British wine critic Jancis Robinson called it one of her favorites when she tasted through a flight of 1994 and 1995 California Cabernets in 1999. But she hasn't tasted it since, she says. American critic Robert Parker gave the 1993 Moraga Cabernet an 89 on his 100-point scale. Not bad for a sort of mom-and-pop operation - Alain Ducasse serves it in Paris. The Times has much more detail. Just Above Sunset stands corrected. Listen up! There IS no War on Terror! I repeat: There IS no War on Terror! None! We have all been conned! A little bit more on that Osama videotape from Friday, discussed in Just Above Sunset on the weekend here. The two men turn out to be well-matched. Bin Laden pisses people off and drives them into the arms of Bush. Bush pisses people off and drives them into the arms of Bin Laden. Bush keeps Bin Laden in business; Bin Laden keeps Bush in office... Bin Laden has shown up on the eve of our election, full of the same impenetrable self-assurance Pat Robertson noticed in Bush. The makes sense to me. In fact, what has caught the attention of the U.S. intelligence community is the strangely conciliatory nature of bin Laden's new message, according to some government officials and outside experts... These experts say bin Laden appears to be intensifying his campaign to "re-brand" himself in the minds of Muslims worldwide, and become known more as a political voice than a global terrorist... The U.S. official said "a political spinoff (of al-Qaida) is one of the greatest fears" of U.S. counter-terrorism authorities, in which bin Laden and the terror network follow the path of the Palestine Liberation Organization, Hezbollah and members of the Irish Republican Army. Over the years, those groups evolved from having an emphasis on committing terrorism into broader organizations with influential, widely accepted political wings. "We want people to think 'terrorism' for the last four days," said a Bush-Cheney campaign official. "And anything that raises the issue in people's minds is good for us."... A senior GOP strategist added, "anything that makes people nervous about their personal safety helps Bush."... He called it "a little gift," saying it helps the President but doesn't guarantee his reelection. Well, Monday is over and Osama Bin Laden is still out there... somewhere. Okay, I'm confused and need some help. Is it just me, or has anyone else in this country noticed that there is no "War on Terror"? But other than that, when you think about it, what has Bush done in this so-called "War on Terror"? He attacked Afghanistan? Big deal! Hell, if 9/11 had happened on Calvin Coolidge's watch, he'd have invaded Afghanistan during a break in one of his famous afternoon naps! Bush invaded Iraq? Okay, if you insist on considering Iraq part of the "War on Terror," then you must admit to it being one hugely-botched battle at best, with terrorists now operating out of that country and doing things Saddam Hussein would never have allowed them to do. But in fact, Iraq, as has now been demonstrated, originally had nothing to do with the war on terror anyway, although probably now it does. Which leaves us with Afghanistan, where the Taliban still lives, and as Osama bin Laden possibly does, too. But in truth, if it's not a metaphor; and it can't really be won in the usual sense; and it's not a law-enforcement thing; and if even Tommy Franks has told people Afghanistan is really more of a man-hunt than a war -- and as has been pointed out before, shortly after our invading Afghanistan, there were more American soldiers in Salt Lake City, protecting the Winter Olympics, than there were fighting our so-called war in Afghanistan -- then where is this war everyone's talking about? Even Bush and his people admit that this "war" has produced absolutely no actual "war prisoners" as such that fall under Geneva Convention protections. Shouldn't that alone tell us something? Look, I have ideas of war in my head. Take WWII; now that was a proper war! So was WWI and the Civil War and the War of 1812 and the War for Independence! Real wars you can see and smell, and run to join up with, or maybe run away from. Korea and Vietnam were called "police actions," but whatever you called them, they walked and talked like wars to me. So if anyone tries to tell you that this is a war unlike others and it isn't between nations and that it doesn't take place in any one chunk of geography, but is in fact taking place in the slums of Hamburg and the jungles of Indonesia, and hundreds of other secret places where these vermin try to hide, and that it won't end with someone signing a peace treaty, and may not /ever/ end in the conventional sense, and is not fought only by soldiers with guns but also by prosecutors with subpoenas ... you see where this is going? Tell them what they're describing is only "metaphorically" a war, but is really mostly just a law-enforcement issue that, like crime itself, will probably never end -- and certainly not the sort of thing to allow a president to lay claim to being a "wartime president". I'm sure future historians will someday compare the mass hysteria rampant in early 21st century America, as it fought its imaginary war, to the Salem witch burnings and communist-hunts during the McCarthy era. I need everyone's undivided attention! Listen up! There IS no War on Terror! I repeat: There IS no War on Terror! None! We have all been conned! Anyone? Please feel free to convince me otherwise. What? That we have not been conned? Pete Townsend just has to eat his own words... can't escape even in the UK! P.S. No one ever called us on budgeting federal dollars in the name of our domestic labels of "War on..." - so why should they question this mirage of tax dollar diversions.? All we need is for Chaney to come up with a new acronym for W-I-N. Any takers there? LOUISVILLE, Ky., June 8 -- Reversing itself, the Army said Tuesday that a G.I. was discharged partly because of a head injury he suffered while posing as an uncooperative detainee during a training exercise at Guant?namo Bay, Cuba. ... a military investigation concluded that there had been no misconduct involved in Mr. Baker's injury. Hmm. The military also says it can't find a videotape that is believed to have been made of the incident. Most appalling, when Mr. Baker told his story to a Kentucky reporter, the military lied in a disgraceful effort to undermine his credibility. Maj. Laurie Arellano, a spokeswoman for the Southern Command, questioned the extent of Mr. Baker's injuries and told reporters that his medical discharge was unrelated to the injuries he had suffered in the training drill. In fact, however, the Physical Evaluation Board of the Army stated in a document dated Sept. 29, 2003: "The TBI [traumatic brain injury] was due to soldier playing role of detainee who was non-cooperative and was being extracted from detention cell in Guant?namo Bay, Cuba, during a training exercise." Major Arellano acknowledges that she misstated the facts and says she had been misinformed herself by medical personnel. She now says the medical discharge was related in part -- but only in part, she says -- to the "accident." Mr. Baker, who is married and has a 14-year-old son, is now unemployed, taking nine prescription medications and still suffering frequent seizures. His lawyer, Bruce Simpson, has been told that Mr. Baker may not begin to get disability payments for up to 18 months. If he is judged 100 percent disabled, he will then get a maximum of $2,100 a month. If the U.S. military treats one of its own soldiers this way -- allowing him to be battered, and lying to cover it up -- then imagine what happens to Afghans and Iraqis. President Bush attributed the problems uncovered at Abu Ghraib to "a few American troops who dishonored our country." Mr. Bush, the problems go deeper than a few bad apples. Well, the mistake has been corrected. Sort of. Baker will get his benefits. Training... indeed. This particular training unit was "Bad Apples 101" it would seem. There's not much to add. There was this terrorism report issued by the State Department a few weeks ago. And it said our policies are working. Terrorism is way down! The administration had a few press conferences about that. All you who scoffed at our policies and said the war in Iraq was making things worse, who said we were creating more terrorists, who said, as Howard Dean said and got creamed for it, that killing Saddam's two sons and putting their mutilated bodies on worldwide display, that capturing and humiliating Saddam Hussein himself, did not make us any safer - well, IN YOUR FACE! All the naysayer cowards and shallow critics of Bush and his policies, well, now you know just how wrong you were! The State Department works to amend its report on global attacks after critics alleged an undercount and political manipulation. WASHINGTON -- The State Department is scrambling to revise its annual report on global terrorism to acknowledge that it understated the number of deadly attacks in 2003, amid charges that the document is inaccurate and was politically manipulated by the Bush administration. ... On Tuesday, State Department officials said they underreported the number of terrorist attacks in the tally for 2003, and added that they expected to release an updated version soon. ... a senior official characterized the errors as clerical, and blamed them mostly on the fact responsibility for the report recently shifted from the CIA to the administration's new Terrorist Threat Integration Center. ... For example, the State Department report listed 190 terrorist attacks in 2003, including 169 "significant" ones. But [Rep. Henry] Waxman said a review showed the report stopped counting terrorist incidents on Nov. 11, leaving out several major attacks, including bombings of two synagogues, a bank and the British Consulate in Turkey that killed 62 and injured more than 700. Waxman said a State Department official blamed the Nov. 11 cutoff on a printing deadline. Baker's brain damage cannot be fixed. Our brain damage? We'll see in November.